Improve productivity, conformity standards, traceability and reporting. Manufacturers are facing ever increasing pressures to improve productivity, conformity standards and reporting whilst at the same time reducing costs. Achieve standards conformity and improve product uniformity and traceability. Reduce the volume of material waste. Reduce the number of products scrapped. Reduce the amount of production stoppage. Reduce the number of end customer complaints. Achieve an overall reduction in production costs leading to a sustainable competitive advantage. Automate reporting and improve quality assurance and product traceability. Remove operator error and improve Health and Safety. An alarm to notify the production operative to take corrective action when the units are outside the set tolerance. Option to integrate data into the production process or ERP system to remove user error, and the requirement for constant monitoring. 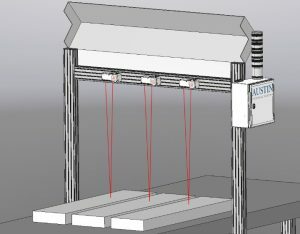 A number of lasers are mounted onto a gantry frame system and record the dimensions of the units as they pass underneath during the production process. The lasers are terminated to a small control box at the end of the gantry frame. This self-contained system minimises any disruption during the installation process. The only services required to the control box are 240V mains, Ethernet and an optional air supply, to keep the laser lens free from contaminants. A PC is supplied with the system which connects to the interface box via Ethernet. This means that the PC can be housed in the safe environment of a control room removing the need to stop the production line in order to take regular measurements of the units. The software interface is customisable to your specific requirements and is intuitive and easy to use – requiring no special skills. The software logs the measurement data and is able to save this to a .CSV, or any preferred file format, and can be integrated into a central ERP system or web-enabled device, if required, to allow operators and managers to remotely monitor the system. Built-in analysis routines automatically detect the Min, Max and Mean measurements and these values are clearly displayed on screen. Tolerance alarms and warnings can be set to automatically alert operators to any issues by visual warnings on screen and a light beacon on the interface box or remote device. This feature can be extended to send email notifications. This cost-effective and adaptable solution is configured to your specific requirements and handle many multiple lines. I would highly recommend Austin Consultants. From the inception of the project to completion they performed an extremely high standard of customer service and knowledge. Improves quality assurance and accuracy – removes human error. Our consultants are from the workforce with a proven track record in delivering engineering solutions in manufacturing environments. We take a pragmatic approach to develop a simple solution that addresses requirements without over-engineering. We offer proven expertise in delivering laser measurement systems. We are commercially aware and offer proven techniques for assessment. Our project process, user training and handover is robust and transparent. Turbine blade measurement. Our global engineering client use lasers incorporated into a fully automated grinding process to measure the height of turbine blades being produced. The system we developed detects and captures multiple measurements along each blade with an accuracy of <10um and passes this data back into the CNC machine to calculate how much material needs to be removed. Contactless substrate measurement. Eminox need to measure and log the diameter and height of substrates on their production line ensuring the outer bodies of the substrate material are formed to the exact size. Our high-speed production line laser measurement system records data and takes measurement accurate to 0.1mm whilst the substrate is rotated at 30RPM. Thin film production line measurement system. We developed a system that allows a leading alloy manufacturer to accurately measure, monitor and record the thickness of metal film being manufactured on their production line.